← Do You Have an Income Problem? Or a Cash Flow Problem? I have lived in California, New Mexico, Vermont, and Florida – all in the last 5 years. Obviously I move quite often, be it for a job or just a change of scenery, so it’s important to me to able to reduce moving costs whenever possible. While I have used everything from U-Haul for do it yourself moves all the way up to full-service movers like Allied or Mayflower, but recently I have discovered the absolute best way to move – which happens to also be the cheapest. My most recent move was a 3,000 mile haul across the country. I had a 10 X 10 storage room of stuff to move, and most of it was already packed up securely and ready to go, as that’s the way I put it into storage back when I did. I knew I finally wanted to move my stuff to where I was living, so I needed to get some estimates on moving expenses. Let’s take a look at those estimates I received along with a cost comparison to the method I finally decided to go with. I contacted three different full-service movers – Allied, Mayflower, and United. Full-service movers both pack up your belongings on one end and unpack them on the other, meaning you don’t really have to do too much work other than box up your goods in your home before they arrive. (You could hire them for that too, but that gets really expensive.) After filling in some online estimate sheets outlining my belongings, I received emails back from each one with dollar amount that they wanted for my move. Not a single one came in under $4,200! That’s quite a lot of money to move my rather small amount of belongings and an amount I wasn’t willing to pay them. So it was on to figure something else out, leaving the full-service movers behind. They were certainly not going to help reduce moving costs this time around. My next option was to investigate hiring a U-Haul or Budget truck to move my belongings myself. I thought that this would come in as a much cheaper alternative, but it turns out I was wrong; it actually would have cost about the same. The truck rental itself came out to around $2,000, the gas would have cost somewhere in the neighborhood of $1,000, a plane ticket out to where my storage facility would run about $200, and then I would have had to pay for food and hotels on my drive back. I was looking at somewhere near $4,000. Doing all the work myself would have cost the same as having someone else do it all, so that would have been a rather stupid choice. A DIY move was out of the question, for sure. The third option, packing a trailer myself and having a company drive it for me, turned out to be the best way for me to reduce moving costs this time around. U-Pack brings a trailer to your location and drops it off, you pack it up, they come get it and drive it your new home. They leave it there for three days and you unpack it into your home. Total cost for the amount of goods I needed to move? Just $2,000. That’s quite a savings! However, there was one problem in that I wasn’t anywhere near my storage facility. Well, the company has movers you can hire as well, so I hired them to move my stuff out of storage and into the trailer for me, with my friend overseeing the entire operation. This cost me $500, which is on the pricey end of what hiring guys to pack a truck should have cost, but they were licensed and insured with U-Pack and weren’t just some random guys off the street. Once they packed up my stuff, U-Pack drove the trailer to my new location and I unloaded it. Total cost, including the movers on the loading up side, was $2,500. Not bad at all, considering I only had to do the work on unloading! So, full service movers would have cost $4,200, moving it myself would have cost around $4,000, and hiring a ABF/U-Pack trailer and movers cost me $2,500. That’s a savings of $1,700 over full-service companies, and it was absolutely painless – even taking while care of it from a distance! If you are looking for ways to reduce moving costs next time you have to move or relocate, I suggest you investigate every option available to you. By loading and unloading a trailer that someone else drove for you, you could save a lot of money over full-service and DIY moves. I know that’s how I will be doing my next move! We always pack it ourselves but pay a moving company to move it. We have some heavy stuff….I don’t think it worth the money to seriously injure ourselves or any friend/family member who was helping! I agree. We have done the same. We pack ourselves and then pay movers. I don’t want anyone I care about getting hurt. I’m from over Canadian Budget Binder way…. My sister-in-law used this idea I think. They had a storage unit dropped off at the house so she could load all the extra stuff they tell you clear out for the sale of the house, so jus the essentials were there for them for a while, when they bought. The new place, the storage box came back, they filled with the rest of their things and it was dropped of at the new house to be unloaded…… She loved it!!!!! Said she would do it that way again…..
Great idea. I hadn’t thought about using those units for that . I will definitely remember that if we ever have to move. We did something similar – we just packed a large crate basically and put it into storage. They then dropped it off at the other end when we were ready. It was great! My brother used shipping palets which seemed to work well the last time he moved. Makes perfect sense and this is super valuable info. We packed and drove from NY to Houston in 1998. What we would do now is declutter the daylights out of our home as we are now doing and move for next to nothing since there will be very little to move! I moved three times one year and I got pretty good at decluttering. It is definitely easier than moving all the stuff you don’t seem to use. When we moved we rented so we didn’t have too much so we packed it all up ourselves and moved it to our new home. As much as hiring movers sounds appealing I was willing and able bodied to do it on my own with a couple of mates. It was worth the beer, pizza and laughs and the experience of moving into our new home. When you can get help it works great. I guess it all depends on what you are moving. Some people just don’t have the physical resources. In 2009 we moved from Minnesota to Vancouver Island (in Canada). We did most of it ourselves, though we did hire help to pack our rental truck as we knew it would be tight. I drove the truck myself–fun! Still cost quite a bit, but far less than hiring a moving company. My brother hired a truck one time too. It is cheaper than the movers that is for sure. You get to see part of the country on the drive too which is nice. Oh, all the times I drove a rental truck. It’s a good time, for sure, but it’s also nice to just get in your own comfy car for the trip! Moving is expensive and I think you should always do a combination of what you can do vs. what you have to do. If you can move everything yourself or with the help of friends, you should. If you have to use a mover, you can take the small items, fragile or irreplaceable things. I have done all of the above i the 4-5 moves I have made over my lifetime. Me too. I have always had movers do the big stuff which keeps everyone safe. The rest has been a combo. We’ve had awful experiences with full service movers, having moved quite a bit during my childhood. I recommend packing things yourself (easier to unpack, as well) and hiring movers once the boxes are ready. I just find the packing services crazy expensive. I can’t bring myself to pay for it. Is the U-pack always the cheapest route, or just with long distance moves? I feel like diy would be the cheapest if it is only across town or across state, but I can see where that can get expensive, especially when you’re driving 3,000 miles. The distance and location of where you are moving to definitely affects the approach. We use the Pod here Its great, just pack it up and ship it it’s at your house before you arrive…..and it’s cheap! Seems like more of you have thought about these pods than me. Great idea. Timely article, my GF is moving in with me this week so she has to pack up her apartment. Her first moving quote from a full service came in at $1500, yikes. That seemed high for her small one bedroom place. We looked into Pods and Pack Rat crates as well. The Pack Rat came in much cheaper at $700. But we then found a mover that quoted by the piece. His quote is $800, so probably just going to go with him. I’d be able to move most of her stuff in my prius, but I sold my SUV last year so I have no way to pull my trailer currently which means I need something for the couches. Congrats on the move in. I think shopping around is a great strategy too. With a little patience you found a very reasonably priced mover. It always pays to compare, too many people never do! We have moved four times in 20 years and the next time will be to the old folks home. 🙂 I better not have any mess to move then. Will have to sell it all off or give it away! We always packed ourselves….it gives me the chance to cull the stuff we don’t need/want. Me too. When I moved three times in one year, I got a chance to seriously declutter. Thanks for sharing the information. it will be a great help for them who are planning to shift. So they can follow all your information to plan how to reduce their moving costs. 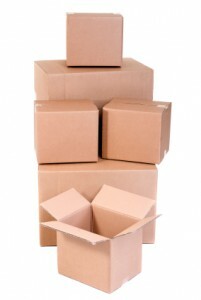 Packing boxes yourself is a GREAT opportunity to declutter as well as saving money. Both times we moved, I was completely unpacked in the space of three days because of how I packed the things in the first place. Plus, when I packed, nothing got broken! I’m moving from Denver to DC in a couple of weeks and I have a Budget truck and dolly reserved for $734. They need trucks in DC and have too many in CO, so I got 20% off! The tricky part will be finding movers to unload the furniture once I get there (Craigslist?). Two UPacks were $1500, which is not bad, but I don’t know where I’d have them park the containers. I had a POD moving in to this downtown Denver apartment and it was an ordeal to find a place to park the thing. If I was moving somewhere that had a driveway, it would be so much easier. Btw, any tips are appreciated!